Wow! We’re happy and very honored that Japanese futurist, strategist Morinosuke Kawaguchi is one of the CEOs chosen as keynote speakers at Japan’s top symposium on quality control . 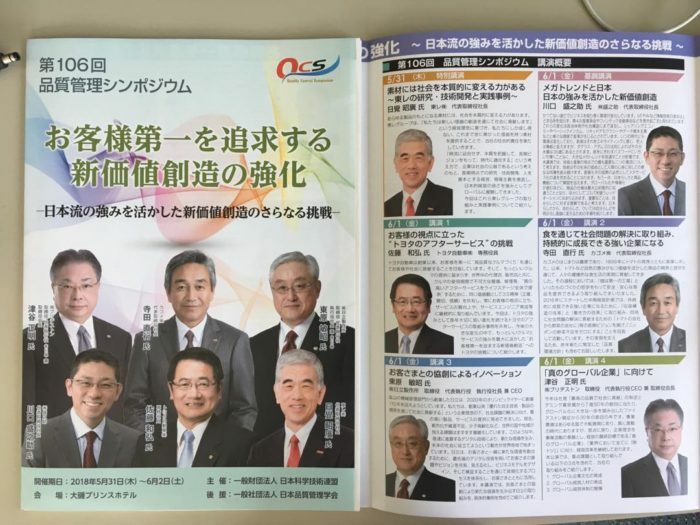 This incredible group of CEOs includes Bridgestone shacho president Tsuya san, Kagome CEO Terada san, Hitachi CEO Higashibara san, Toray CEO Nikkaku san, Toyota Senior Managing Officer Sato san, and Morinoske CEO Morinosuke Kawaguchi! So honored that our company Morinoske is represented in such a fantastic group! Thank you!